Fr. Kevin Klonowski was born in 1989 in Cleveland to Scott and Vicki Klonowski. He and his younger sister, Andrea, grew up in Parma, Ohio. Fr. Kevin attended St. Charles Borromeo Church, where he received the sacrament of initiation and where he attended the parish school. He went on to St. Ignatius High School, where, during his senior year, he discerned a call to the priesthood. Fr. Klonowski entered Borromeo Seminary in the Fall of 2007, and he completed a Bachelor of Arts in Philosophy through John Carroll University. Fr. 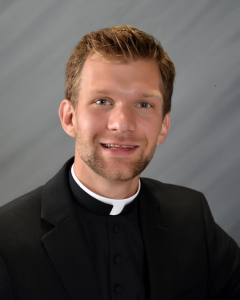 Klonowski then continued his studies at St. Mary Seminary and Graduate School of Theology, earning a Master of Arts in Theology and a Master of Divinity. Throughout his time in the seminary, Fr. Klonowski served parishes and institutions in Cleveland Heights, East Cleveland, Collinwood, Westlake, Avon Lake, and Painesville. In his free time, Fr. Klonowski enjoys road running, reading, baseball, and music.